The New Zealand ABC. 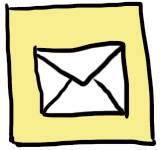 Each letter includes pictures of uniquely NZ things. My favourite is K. If you look carefully on the cover you might also be able to spot a lamb and a takahe. I think this will be a favourite with visiting littlies. 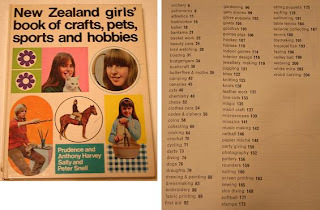 And lastly, my favourite of this bunch: the New Zealand girls' book of crafts, pets, sports and hobbies. This one falls squarely in the "I wish I had owned it" category. It was published in 1972 and looks like an early NZ version of the Daring Book for Girls. You can see a bigger version of the index here, but it contains information on (almost) everything a young girl in the 70s might want to know about, from astronomy to codes and ciphers to kites, paper mache, tadpole collecting and so on. I've included a picture of the fabric printing page below. How fabulous! What a great haul! I love that ABC book, must keep an out for that for the children. And how gorgeous is that NZ hobbies book for girls!! No way!! I remember that exact horrakapotchkin journal from primary school - doesn't it have a story about a band of travelling animals? And i remember the ABC book too - it had beautiful illustrations...jealous! 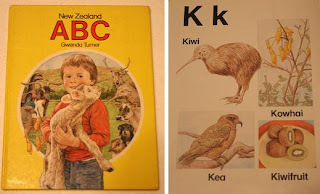 that NZ ABCs book is a classic! Great Books! Love all things Kiwiana! We had a copy of that girls book in our house growing up. If my memory serves me accurately it had a section on cats. Once upon a time I longed for a cat - now I long to get rid of my "step cat" which came with my husband. I suppose as baggage goes I got off pretty lightly but it doesn't feel that way when pamper puss wants breakfast at 4 am.